When I go to the Toronto International Film Festival, I’m looking for a very specific sweet spot. I’m looking for films that aren’t big enough to have a release date in American theaters this year, but not so obscure that they couldn’t fill an auditorium back home. Ideally I’m balancing movie quality with crowd appeal (although as far as Movie Habit is concerned, I’m secretly just looking for quality; crowd appeal be damned). Preparing for Toronto by reading blurbs and researching filmmakers pays off in avoiding the duds and snoozers inevitable in a festival the size of Toronto. But you can’t research everything, since many of the films showing at TIFF are having their world premiere. And you can’t really predict anything. Half the fun of TIFF is finding yourself at a second- or third-choice film, simply because it fit your time slot, only to realize you’ve stumbled on one of your favorite films of the fest. I think it’s only fitting that the first batch of TIFF films I write about are the ones that are really good, but may not have been praised elsewhere. These are the underrated films of TIFF that I saw; films that deserve more attention than they’ve been getting. Let’s start with the film most likely to see the light of day, Shelter. I went to Shelter with some trepidation. Alex Cox once planted the idea in my head that most actors make terrible directors (I think he’s probably right), and Shelter is the directorial debut of Paul Bettany, whom you may have seen in A Knight’s Tale or Creation. I’ve never been a big fan of Jennifer Connelly, but she’s never been better than in Shelter. 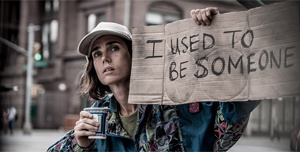 She plays a homeless woman, Hannah, whose current condition is more important than her back story. Her character was college educated; she intimidates some French tourists by understanding their language and throwing it back at them. But bad things happened in the past, and here she is now, an addict living on the streets in New York. Anthony Mackie, who shone in The Adjustment Bureau isn’t bad as a former soldier of Boko Haram, also living on the streets, but he fades into the background behind Connelly’s riveting performance. I don’t love everything about Shelter. But for a film with star power and a solid production budget, Shelter is not getting the buzz I might have expected. You might also see 1001 Grams this fall, particularly if you pay attention to the foreign-film Oscar list. Bent Hamer, who directed the quirky comedies O’Horten and Kitchen Stories, may receive Norway’s nomination to the Oscars. If you didn’t know about the film’s drily comedic tone, you might find the story boring. A father and daughter work at Norway’s weights-and-measures bureau. Usually he takes the national prototype — the official Norwegian kilogram — to the kilo conference in France. But father gets very sick, and the daughter Marie (Ane Dahl Torp) is assigned the task and the honor instead. 1001 Grams is about weights and measures. A daughter and a father. New ways and old ways. Curves versus angles. Rational numbers versus irrational numbers. The film doesn’t have “jokes” per se, but the visuals are witty, almost without fail. Marie lives in a modernist house that Jacques Tati would settle for, and she drives a boxy little electric car that Mr. Bean would kill for. Meanwhile her father lives on a farm and naps in the hay, even though he doesn’t raise livestock. Is it a stretch to say that cars and architecture can count as “jokes”? I say it’s no stretch at all. For me, 1001 Grams was just the right amount of wit. Whether you are able to see Tigers might depend on whether the distributor gets sued by lawyers at a certain multinational corporation that makes chocolate and baby formula, and whose name rhymes with Schmestlé. Tigers is a whistle-blowing thriller with two layers. The outer film is a drama about a filmmaker who isn’t sure he wants to anger said corporation by making a movie about the baby formula scandal in Pakistan. The source of his story would be Ayan (Emraan Hashmi), a sales rep for local medicines in Pakistan who gets a much-better-paying job when he is hired by the company whose name is changed to “Lasta” in the film-within-a-film. Jake Gyllenhaal hustled Viagra in Love & Other Drugs, and that’s how Ayan and his colleagues handle their baby formula. Ayan’s job is to befriend doctors, nurses, pediatricians, pharmacists — anyone who can help promote and sell the company’s baby formula. As their personal good friends, Ayan sees to it that they all get as much Lasta chocolate as they can stand, not to mention sponsorships, golf trips, professional networking, anything that costs less than the profits on baby formula. The problem isn’t that the baby formula is tainted — it isn’t — it’s just that it’s a really bad idea to market it in poverty-stricken parts of the world. Breast milk is free and it nourishes babies just fine. But formula only works if 1) you don’t have tainted water, and if 2) you don’t dilute it — two problems that are insurmountable in certain parts of the world. Images of malnourished babies in Pakistan — some shot quite recently — illustrate the point vividly. I really like Tigers as a tense, lean, and exciting “moral outrage” story. You might have to go out of your way to see Frailer: Til Death Do Us Part. It’s a Dutch film about four female friends getting together to support Mouse (Leonoor Pauw), their friend who has terminal breast cancer. It follows a 1997 film called Broos with the same cast playing the same characters. One friend makes four identical dresses for them all to wear. 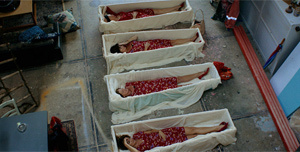 Another has the idea to confront death head-on by arranging four coffins to lie in while they agree to open up to each other completely. Lower-quality video footage sneaks into the film, apparently outtakes and behind-the-scenes footage. It isn’t too long before one such interruption features a genuine emotional breakdown from one of the actors who can’t deal with the blurring of acting and real life. It is Pauw, not Mouse, who got the terminal diagnosis, and it proves to be more drama than a film drama can hold. At that point the dramatic pretense is mostly dropped and we watch Pauw, and her friends and family, deal with her fate. Perhaps an experiment like this, in Dutch and with actresses Americans won’t recognize, won’t sell a lot of tickets. But mass appeal be damned; Frailer is frank, beautiful, and affecting. Some films promise to change you. This is the one at TIFF that actually did. 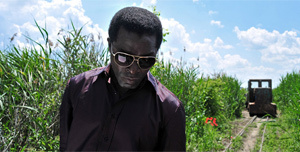 An African man, Francis (Isaach De Bankolé), possibly Ivorian, possibly a professional soccer player, is wandering through the wide-open fields of Hungary. He whistles the Marseillaise. He wears big aviator sunglasses and a slim leather jacket. He doesn’t look like Clint Eastwood, but he’s got almost as much swagger and charisma — enough to carry a movie. The film starts in the middle of his journey, so we don’t know where he’s been, but he catches a strange, rusting train from one village to another. Then he’s captured and driven by jeep to an even more remote compound. There are overseers and other workers like him. A woman slips him a note that says the farm used to belong to her family, and these men just showed up and took it; please help. In a more conventional movie, that note would drive the plot. But here, things are more complicated. Francis is not a cowboy hero, and he knows that one man cannot do anything against an armed elite. The white bosses seem to know our man has something of value, but until they can find it they’re happy to profit from his labor. Mirage does a great job telling its story without stopping to explain itself. In fact, a lot of the movie happens without dialogue. (The film also has chapter titles that use icons, not words.) Mirage is a bit mysterious, but knowing what little I do about current bad things happening in Hungary makes the mysterious seem more ominously political.